I LOVE Fall.. The smells, the beautiful leaves, and...PUMPKIN EVERYTHING! Everywhere you turn, people are experiencing the glorious taste of pumpkin- in pies, cakes, scones, coffee, the ever famous Pumpkin Spice Latte, and more..and I love it! 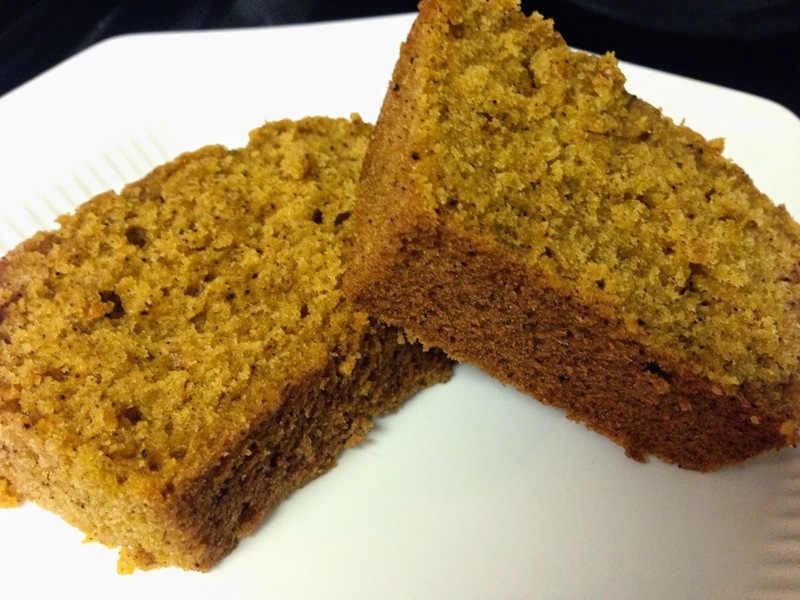 One of my favorite pumpkin treats is pumpkin bread or muffins. It is perfect for a nice fall breakfast or as a mid-day snack. 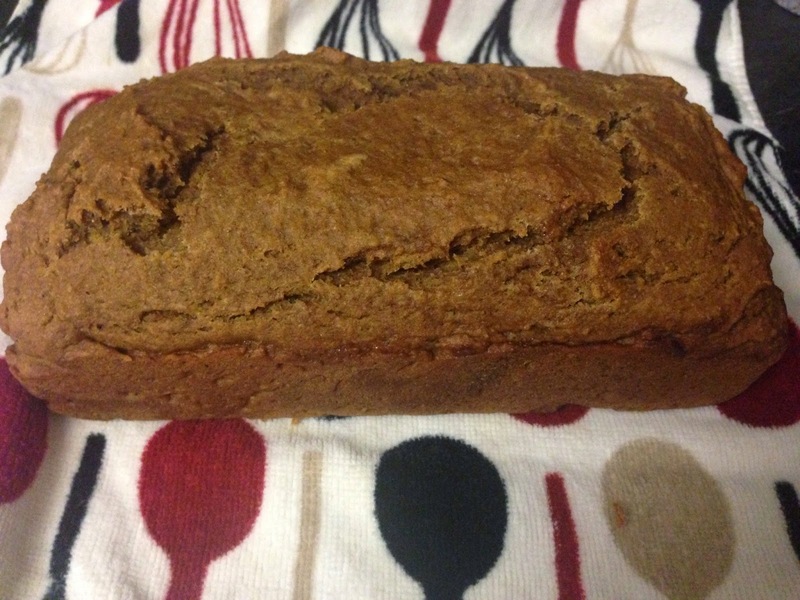 Last week we were at Disney World for 5 amazing days, and before we left I thought I would try to create a pumpkin bread that was Collins friendly but that was also a little healthier than many varieties that we could take along for the trip. Now, if you are looking for no sugar, no oil, all wheat bread, this isn't it! But the white flour and sugar are reduced and I use unsweetened apple sauce for half of the oil. I think it turned out quite well! Collins is not a fan of trying new things (which is REALLY frustrating when you are already cooking with many restrictions), but I told her the muffin was a "gingerbread cupcake" and she ate and loved it! Preheat oven to 325 degrees. Lightly grease two loaf pans ( I use Pam grilling spray bc it is soy free and most other sprays contain soy). You can also do one loaf pan and make the rest as muffins, which is what i normally do. Combine all ingredients in a large bowl. Mix on low for about 1 minute, just until most lumps are out. Bake loafs for about 50 minutes (muffins take less time. I put 1 loaf and muffins in at the same time and removed the muffins about 15 minutes before removing the loaf). Bread is done when toothpick inserted in center comes out clean. Keep an eye on these the first time you make them because using different loaf pan sizes and making them into muffins will alter cook times. Want to 'spice' it up? 1 cup chocolate chips (or enjoy life dairy free choc chips), 1 cup walnuts, 1 cup pecans, 1/2 cup raisins, orange juice instead of water, increase vanilla extract to 3/4 teaspoon. NOTE: THIS BREAD IMPROVES WITH AGE. IT IS MUCH BETTER THE SECOND DAY!! If I plan to bring this to someone, I always make it the day before. I purchased these cute smaller disposable loaf pans from Michaels, and was able to get 4 loafs out of the recipe. I think these will be great gifts!